We had a family wedding last month, and of course they used sample packs of Fairtrade Certified coffee as their party favours. 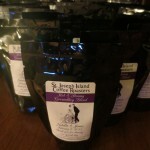 This is the third or fourth (and biggest) wedding that we have provided with fairtrade coffee wedding favours. 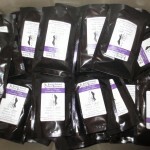 200 samples packaged and sealed! In the bin for delivery . . .
At the wedding. Looks pretty fancy!